From traditional, time-honored recipes to those using fresh, innovative ingredients, the best meatloaf recipes are bursting with flavor. Utilize your favorite cooking method and consider spicing up your meatloaf repertoire with one of these top recipes. A meatloaf recipe with rave reviews from over 1,300 readers and home cooks, Yes, Virginia There Is a Great Meatloaf on Genius Kitchen features ground beef, fresh Vidalia onions, and a unique sweet and tangy sauce made with half-and-half, apple cider vinegar, ketchup, and brown sugar among other ingredients. Reviewers love that this recipe is easy to make and give it top marks for its texture and taste. This is ideal for those who like a saucy meatloaf on the traditional side. The MidAtlantic Restaurant and Taproom, located in West Philadelphia, was honored by Bon Appetit as having one of the best daily specials in the country: their MidAtlantic Meatloaf with Mushroom Gravy. Filled with luscious ingredients like cremini mushrooms, cream, shallots, and red wine, it's a meatloaf that is rich and delicious. You can make it at home with about 45 minutes of prep and one-and-a-half hours of cooking time though it can be made the day ahead as well. A five-star rated recipe from well-known Food Network chef Paula Deen, this Old-Fashioned Meatloaf is a must for those who are looking for a hearty traditional staple. You can make this classic style recipe with pantry staples you likely already have, including ground beef, onion, green pepper, oats, diced tomatoes, and brown sugar. Reviewers praise it for its moistness and flavorful taste. 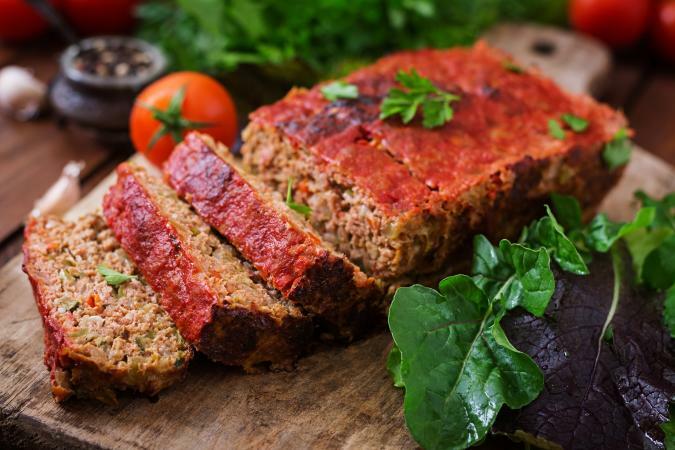 Boasting a five-star rating, the Unbelievably Moist Turkey Meatloaf Recipe on Inspired Taste offers a healthier version than traditional ground beef, but without sacrificing taste. The secret ingredient is finely chopped mushrooms, which keep it moist and delicious. Other ingredients include panko bread crumbs, Worcestershire sauce, and fresh garlic, all of which contribute to its excellent flavor. Reviewers say that even picky eaters and fans of traditional meatloaf will love this recipe. Cookbook author and PaleoOMG blogger Juli Baur offers a recipe for her succulent Instant Pot Sweet and Spicy Garlic Herb Meatloaf that gets an impressive 4.6 out of 5 star rating from reviewers. This is not only perfect for those following a paleo or gluten-free diet, but can also be made quickly in an Instant Pot or pressure cooker. Brimming with fresh herbs, onions, and bell peppers, this meatloaf gets some extra depth of flavor with its sweet, spicy sauce. If a slow cooker is more your speed, you'll love this Melt-in-Your-Mouth Meatloaf featured on Allrecipes.com. With a solid 4.5 out of 5 rating from over 600 reviewers, this recipe stands out for being juicy and having a good texture. Milk, mushrooms, and sage contribute to its flavor. It only takes 15 minutes of prep time and just over five hours in the slow cooker, so you won't spend all day in the kitchen for a great meatloaf. Betty Crocker is a household name, so it should come as no surprise that that this top-rated recipe for 30-Minute Mini Meatloaves is found on the brand's website. Made with a mix of beef and ground pork, it's a fun, family-friendly option that doesn't take much time. It's unique in that it uses baking mix rather than breadcrumbs or oats like many recipes do. Reviewers give it high marks for being a favorite among all ages. Culinary writer and Forbes contributor Nadia Arumugam not only did a study on the history of meatloaf, she had testers evaluate various popular meatloaf recipes to come up with one that had great taste and texture. The result? A new recipe that comes close to perfect. She notes the subjectivity of measuring the taste of meatloaf; there's always something someone else might change. Her combination of beef, pork, carrots, bell pepper, onions, crushed saltines, and a tangy glaze equals her Ultimate Meatloaf (Almost) recipe. If you're looking for an excellent recipe that doesn't require a lot of ingredients or extensive prep, consider this Prize-Winning Meatloaf. Made with just seven ingredients you probably already have on hand, this simple meatloaf only takes a few minutes of prep time and is ready in about an hour. Since this lacks a sweet glaze, it's great for those who prefer a meatloaf that isn't sweet. Named the best meatloaf recipe ever according to Esquire, celebrity chef Michael Symon's Most Comforting Meatloaf utilizes Italian sausage, beef, cilantro, garlic, butter, and red onion for a flavorful blend of ingredients. Symon suggests making the most of simple ingredients to incorporate flavor into your meatloaf. Looking for a fancier way to dish up your meatloaf? Consider Food and Wine's Meat Loaf Stuffed With Prosciutto and Spinach. Nearly 4,000 reviewers rate this recipe and it gets a very good four-star rating overall. It requires a bit more prep and cooking time than some other recipes, but the result of this pecorino and red wine-infused dish make the luxe results well worth it.